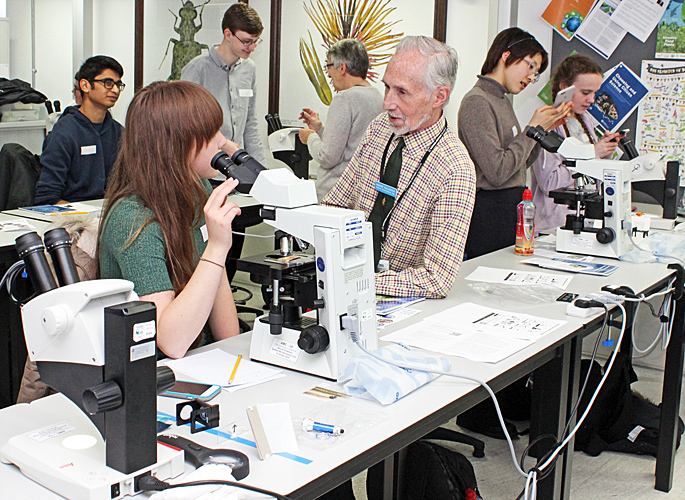 The two previous workshops for Arkwright Scholars on the uses of the optical microscope were a success, and so another was held this year in the same location, the Angela Marmont Centre in the Natural History Museum in London. The Arkwright Engineering Scholarships are awarded by the Arkwright Scholarships Trust and support students through their A Levels or Scottish Highers and provide financial assistance to help them pursue engineering, computing or technical design at university or through a higher-level apprenticeship. The Scholarships are sponsored by industrial companies, universities, charitable trusts, trade associations, professional engineering institutions, the Armed Services, Worshipful Companies, industry regulators or personal donors. Quekett members Dennis Fullwood, Pam Hamer, Mary Morris, James Rider, Paul Smith and Alan Wood assisted at the workshop. 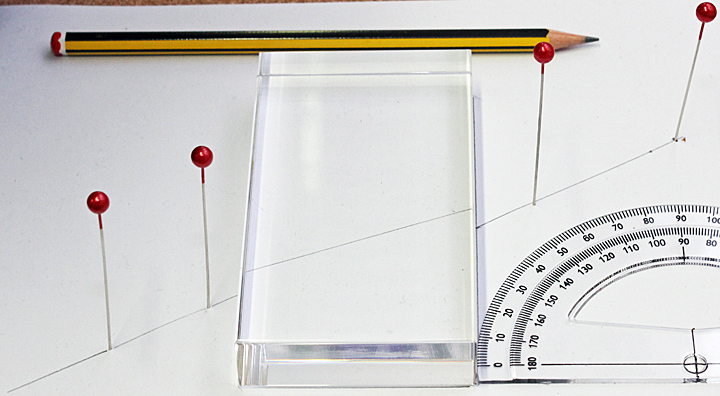 We started with some theory of optics, including refractive index, refraction and diffraction, and how diffraction affects resolution (the detail that can be observed). 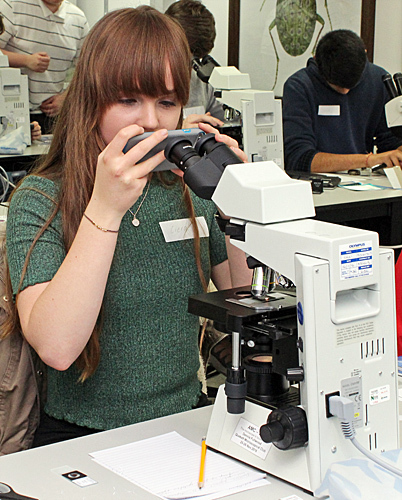 We then showed the Scholars how to arrange 2 simple positive lenses to function as a basic compound microscope, with the first lens (objective) providing all of the resolution and some magnification, and the second lens (eyepiece) providing additional magnification. After the theory, the Scholars were talked through setting up their stereo and compound microscopes, to get the best possible illumination and to adjust them for individual eyesight. 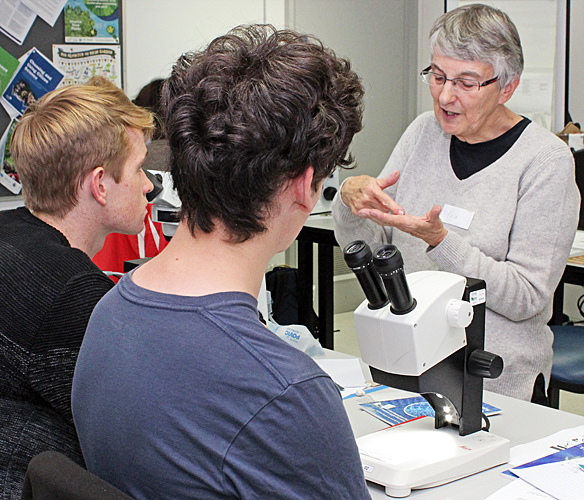 The Museum kindly provided 6 Leitz EZ4 zoom stereomicroscopes (8× to 35×) and 6 Olympus CX41 compound microscopes with 10×, 20×, 40× and 100× phase contrast objectives and substage condensers that could provide bright field, dark ground and phase contrast. With 6 Quekett members and 12 Scholars we were able to provide a good level of assistance when needed. 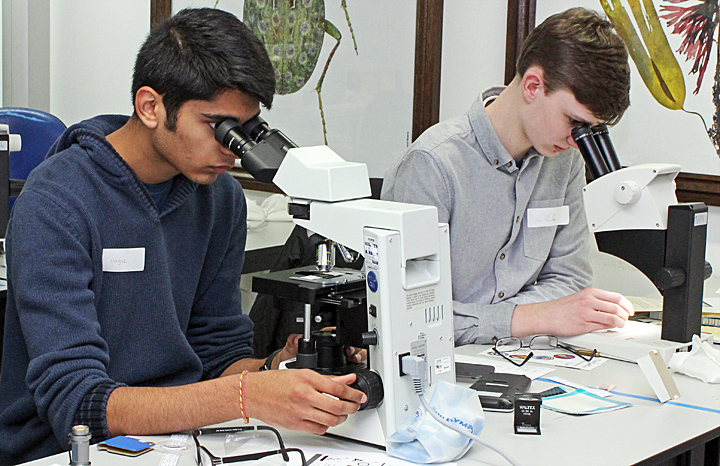 With their microscopes properly set up, the Scholars were introduced to the 2 composite materials that had been provided by Solvay, one of the Arkwright sponsors. 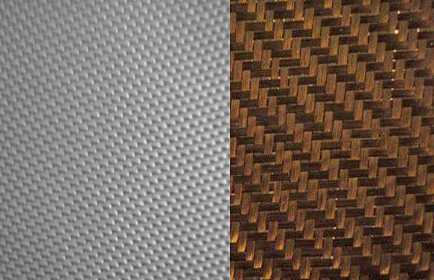 One was a carbon tooling laminate containing carbon-fibre and glass-fibre mats; sections had been made from this, and samples of fibres were provided. 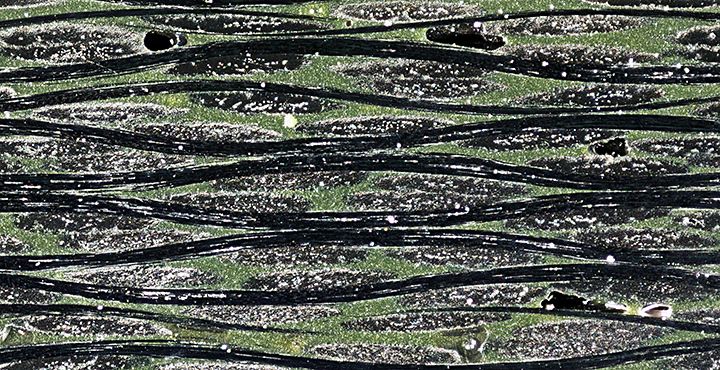 The laminate was of a type used on high-performance boats and cars. 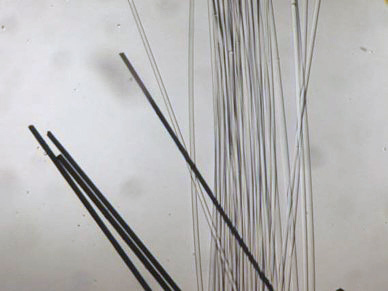 The Scholars were provided with prepared microscope slides of carbon fibres and glass fibres (with human hair and spider silk for comparison), and were shown how to examine these using the Olympus compound microscopes. They used not only standard bright-field illumination but also 2 methods that provide enhanced contrast, dark ground and phase contrast. 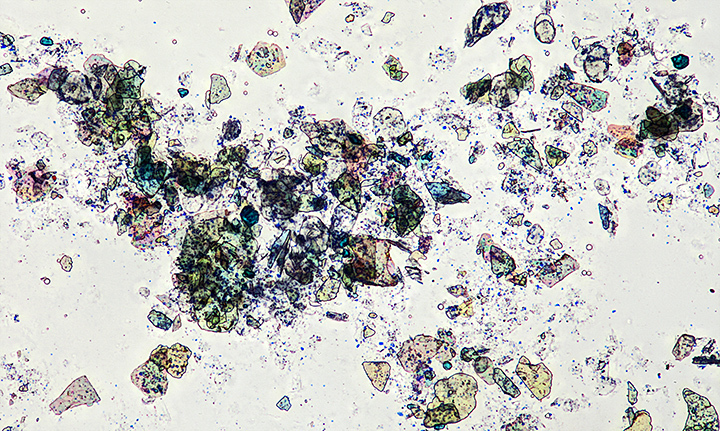 The Scholars were surprised to see the huge difference that lighting techniques can make to the appearance of a specimen under a microscope. 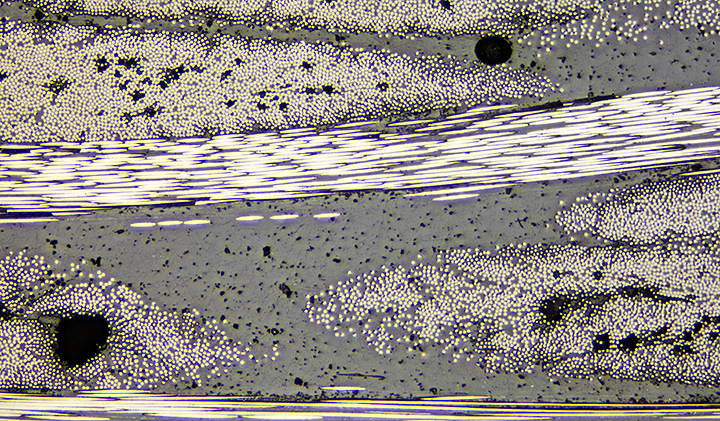 Sections of the laminate (approximately 22×6 mm) that had been mounted in resin and then polished were provided for examination under the Leitz stereomicroscopes, and the Scholars were set the task of calculating the percentage occupied by voids in the exposed surface. 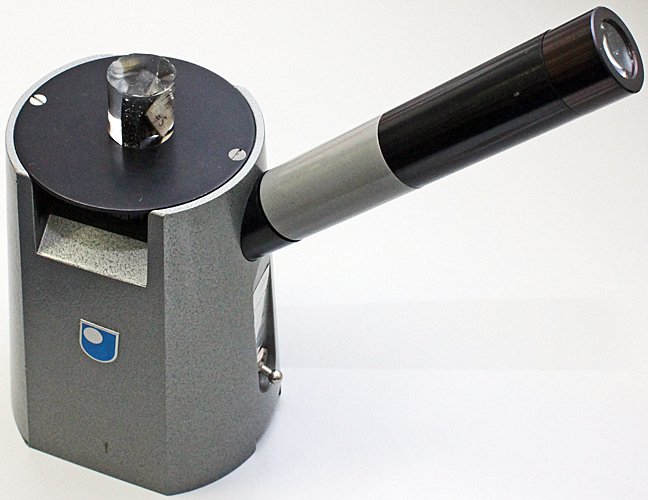 An inverted metallurgical microscope that uses reflected light for observing opaque subjects was also provided for examining the sections of laminates. This has a fixed, flat stage at the top, allowing large and heavy specimens to be examined, and uses prisms or semi-silvered mirrors to direct light through the objective onto a reflective subject. 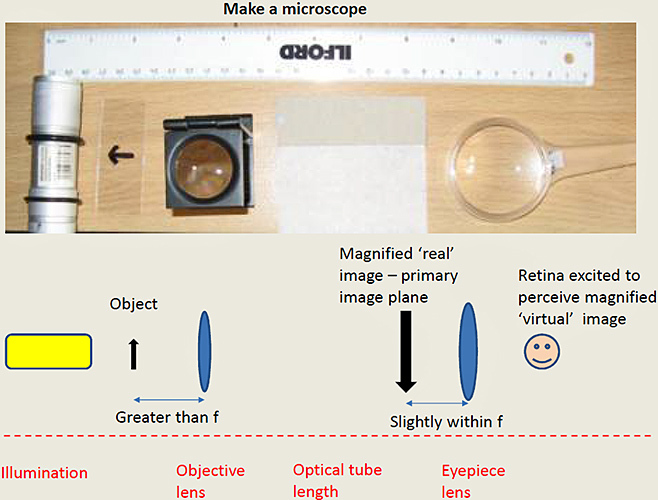 The objectives on this microscope are corrected for observing uncovered subjects, unlike those on the Olympus microscopes that are corrected for specimens under a 0.17 mm glass coverslip. 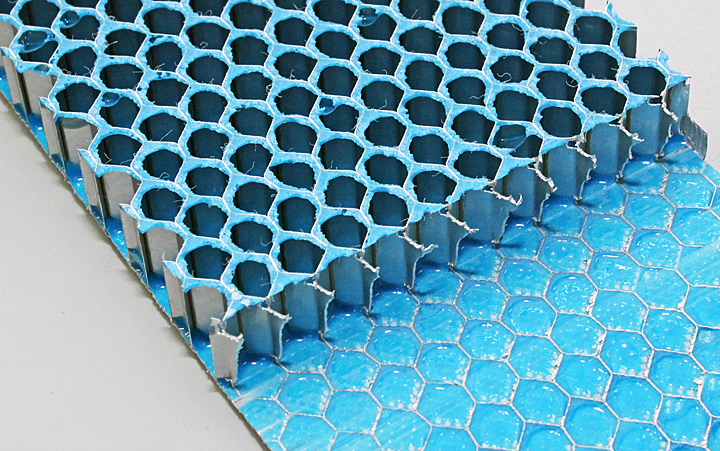 The other subject provided by Solvay was a climbing drum peel test coupon (a honeycomb sandwiched between 2 metal sheets, used for crumple zones on cars). 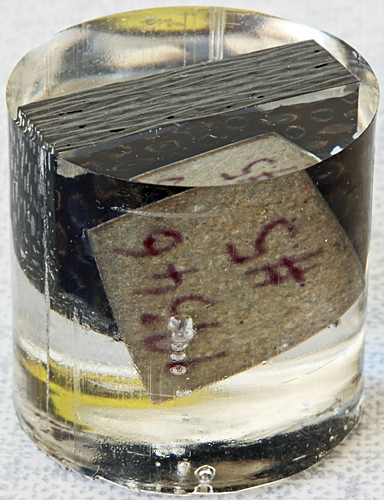 One metal sheet had been peeled back to determine the bond strength, and this then made it possible to observe bubbles (faults) in the blue adhesive and the size and shape of the adhesive fillets produced during bonding. 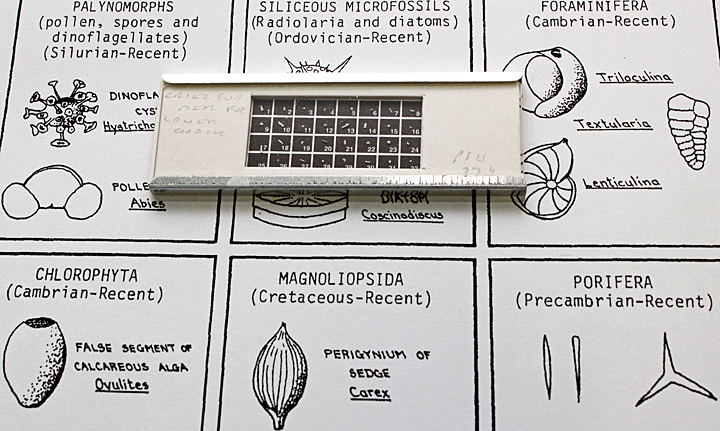 Specimens of this size are best observed with a stereomicroscope. 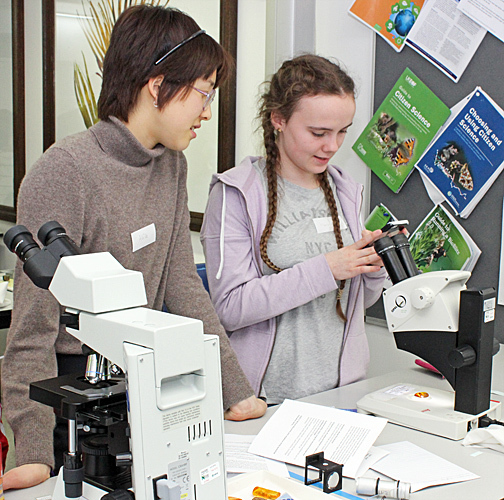 After the engineering examples had been thoroughly examined, there was time to introduce the Scholars to other microscopical techniques and specimens. 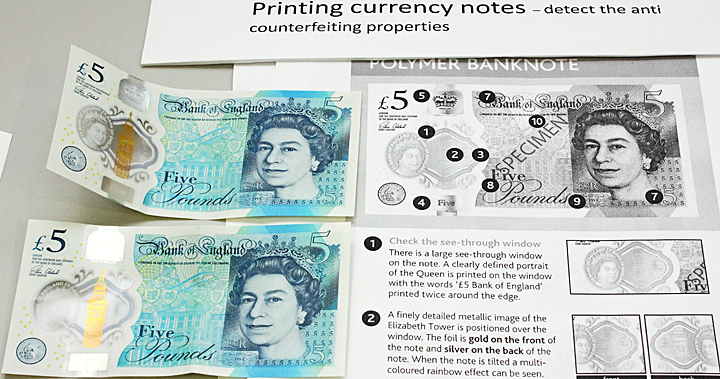 Pam Hamer showed some slides of effect pigments in eye shadow and blue paint, counterfeit £1 coins, security features in the new polymer £5 notes, and microfossils. 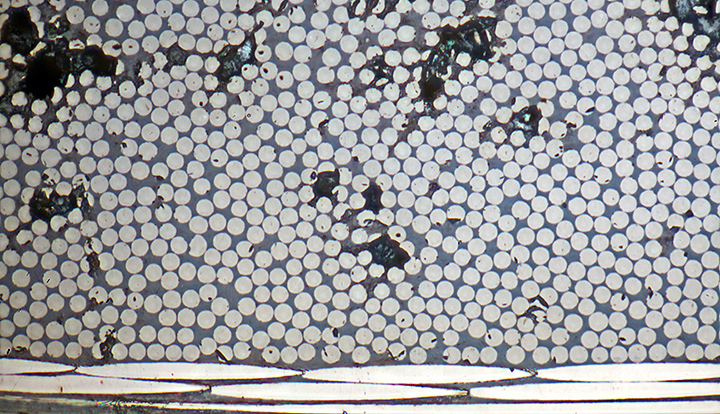 The design of £1 coins has not changed in 30 years and about 3% of those in circulation are counterfeit. If you check your change you may be able to spot counterfeits. A new £1 design with state of the art security features will be introduced in March 2017. 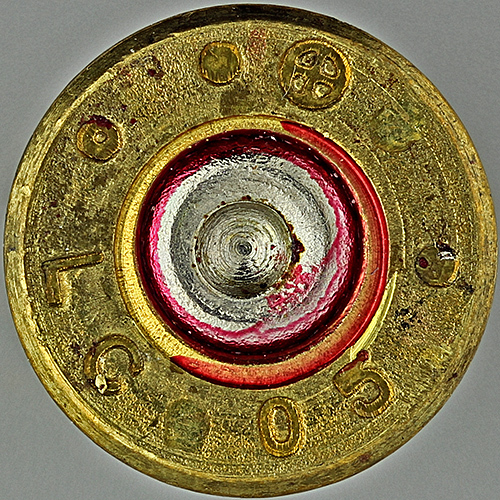 Dennis Fullwood got the Scholars to test their powers of observation by giving them one spent .223 cartridge case and asking them to find another one that had the same pattern left by the firing pin and therefore had been fired from the same rifle. The Leitz stereomicroscopes were used for this. 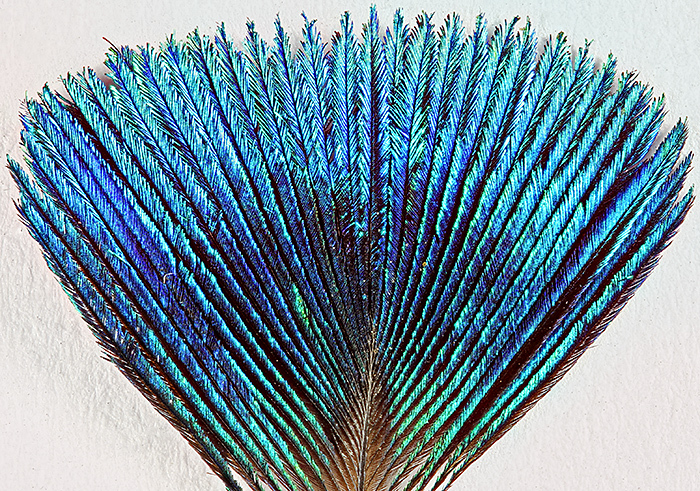 Dennis also provided some feathers from the corona of peacocks, demonstrated how to prepare a dry mount (the specimen is in air, not in a liquid or solid mountant) and then guided the participants through preparing their own slides that they could take home. 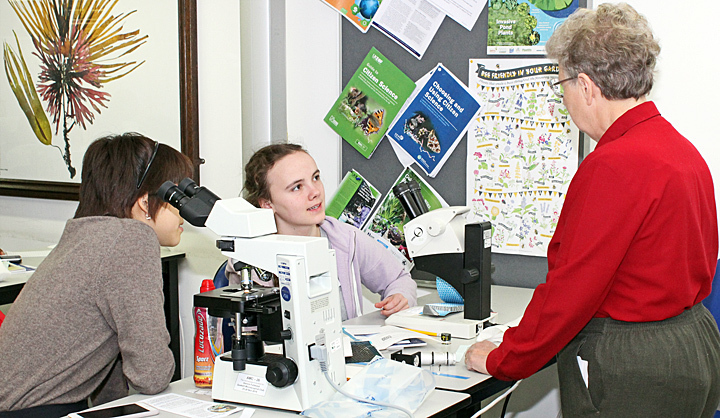 Dennis also showed several prepared microscope slides, Baltic amber containing insects, and some locusts. 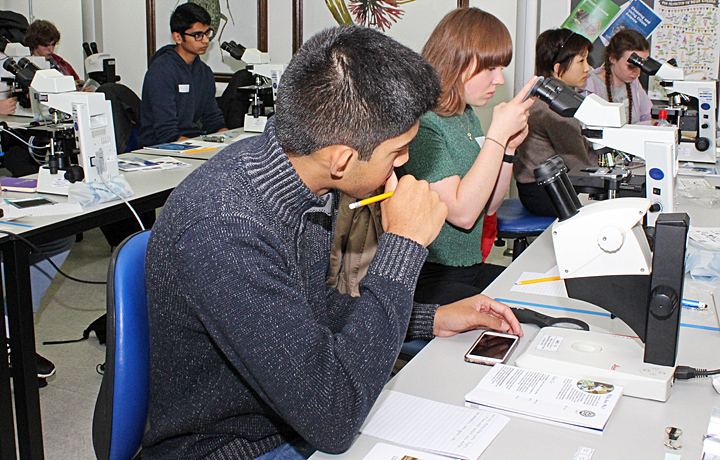 Here are some more photographs of the Scholars during the workshop; they used their mobile phones to take photographs of the specimens, by carefully positioning them over one of the microscope eyepieces. 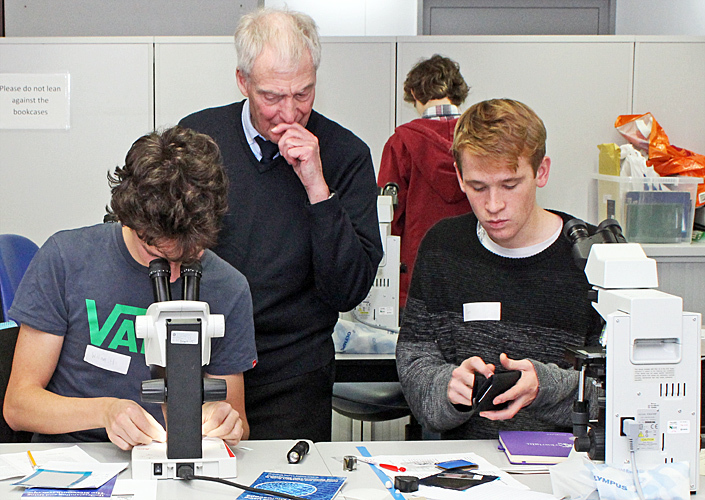 Two books by Quekett members were given to each Scholar: Understanding and Using the Stereomicroscope by Lewis Woolnough and Understanding and Using the Light Microscope by Chris Thomas and Lewis Woolnough.